The pseudo-debate about whether Keynesians and other fellow travellers ought to be embarrassed when governments that engage in fiscal austerity nevertheless experience positive economic growth rates has become a distraction. For countries like the US and the UK, it is possible under current circumstances for governments to implement budget cuts and still see their economies grow. But the truth of that statement is not fatal to the Keynesian-inspired critique of austerity policies; it is not by any means the end of the story. The more meaningful question is this: What would have to happen in these economies for significant growth to occur in the midst of budget tightening? Finding an answer to that last question is one of the strengths of the approach to thinking about the economy pioneered by Wynne Godley, and fleshed out further in the Levy Institute’s strategic analysis series. This approach also provides a clear understanding of how deeply irresponsible it is to cut government spending under present economic conditions: because the danger, given the state of the US and UK economies, is not just that budget cuts might slow down the economy, but that they might not. The Congressional Budget Office is predicting that the budget deficit will continue to shrink over the next few years, from 2.8 percent of GDP in 2014 to 2.4 percent in 2018. At the same time, the authors note, the CBO is telling us that GDP will grow at 2.8 percent, 3 percent, 2.7 percent, and 2.1 percent in 2015, ’16, ’17, and ’18, respectively. If we assume that both of those forecasts (for the budget deficit and GDP growth) come true, what would the rest of the economy need to look like? The United States has run current account deficits, which act as a drag on economic growth, for decades. And despite the recent increase in net exports of petroleum products, which has helped keep the US trade deficit from returning to its sky-high precrisis levels, there is little reason to think that the external deficit will substantially improve over the next few years (if anything, the authors argue, it is likely to get worse. There’s more on recent developments in the foreign sector beginning on p. 6 of the report). That being the case, GDP growth rates of the sort projected by the CBO can only come to pass on the basis of a rise in private sector spending. In fact, Papadimitriou et al. show that private sector spending would have to expand so much that it would exceed private sector income for the first time since the crisis. In other words, growth would depend on rising private indebtedness. 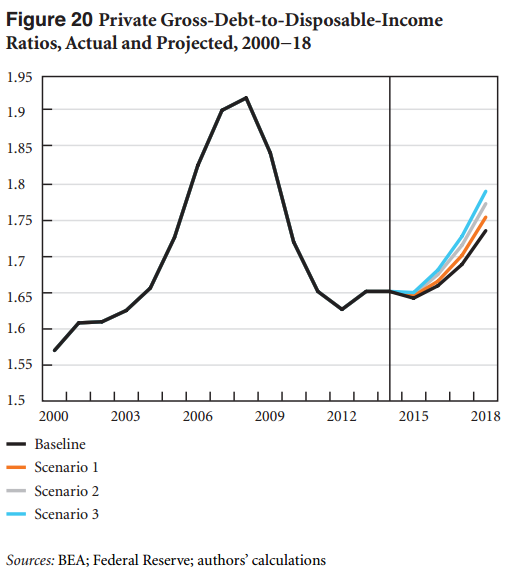 If private spending doesn’t blow up in this way, the CBO’s optimistic growth projections won’t come about. But if growth does occur, it can only do so (given the external deficit) through a process that raises the debt-to-income ratio of the private sector. As the authors point out, this is precisely the same process that led to the Great Recession and its aftermath. 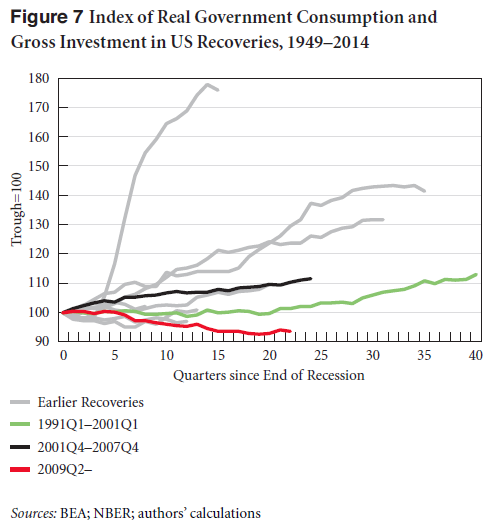 To bring this back to the tired discussions surrounding austerity policies: yes, it is possible for the United States to have both tight budgets and rising GDP over the next few years. Fiscal conservatism doesn’t make economic growth impossible in the near term — it makes it impossible to grow without increasing financial fragility. In the absence of a significant increase in net exports, keeping the government budget on its current track will lead to either stagnation or an acute crisis. Austerians in the United States and elsewhere have been allowed to portray themselves as the champions of steely-eyed realism and prudence. In reality, unless their budget proposals come attached with some workable plan to substantially reduce trade deficits, they are courting private-debt-driven financial crises. In any meaningful sense, they are the true practitioners of fiscal irresponsibility. Does Keynesian Theory Explain Indian Government Bond Yields?